Telecom Regulatory Authority of India (TRAI) has been taking tough stand on Pesky Callers and Spam SMS senders over past few months. They came up with string of directives to ensure that menace of unsolicited commercial communication (UCC) is curbed to large extent. With the directive coming into force, there has been a definite reduction in UCC. However, many telemarketers have still not registered with TRAI as per the mandate. One of the reasons being high security deposit and registration fees charged at the time of registration. 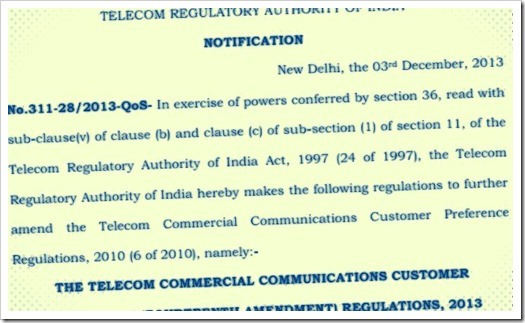 Taking this into view, TRAI has come up with an amendment in Telecom Commercial Communications Customer Preference Regulations, 2013. The amendment puts forth lowering of charges for telemarketer registration. In addition to this, major entities like banks and insurance agencies also requested TRAI to reduce the registration fees and also the security deposit with the service providers to remove the entry barrier for small dealers/ agents. Prior to to this amendment, a telemarketer needed to give Rs. 100,000/- upfront as security deposit and Rs. 10,000 as registration fees (Rs.1,000 Registration Fee + Rs.9,000 Customer Education Fee) to service providers for taking telecom resources. The registration period is now extended from three to five years. The existing registered telemarketers can renew their registration by paying a renewal fee of Rs.5000/-. The Registration Fee is reduced from Rs. 10,000/- to Rs.5,000, which will be a common Registration Fee, without any separate Customer Education Fee. This initial security deposit with the service provider is reduced Rs.1,00,000/- to Rs.50,000/-. According to the TRAI press release, these revised rates will come into effect after 30 days from the date of amendment. While we have always advocated the tough stand taken by TRAI, I think in this case the right thing was to bring down the charges, so that telemarketers are able to have formal registration. With such high fees and deposits, hardly any telemarketer (apart from larger ones) would register, beating the whole purpose. However, with new fee structure in place, the onus falls on telecom provider to ensure that all marketers who send messages through their network are registered and send legitimate messages only.